At a key meeting on July 31, the Political Bureau of the Communist Party of China Central Committee signaled that in the second half of this year, China would focus more on keeping the economy stable amid external uncertainties. China's macroeconomy, however, may face some downward pressure in the second half of 2018. The core factors impeding domestic private investment growth have not been completely eliminated. High housing prices and mortgage are still restraining the growth of household consumption. And the hidden financial dangers could be exposed owing to deleveraging and strengthening of financial supervision. Among the major external risks are the declining growth rates in major developed economies, increasing financial risks in emerging economies and the uncertainties of global trade policies. And these external risks, combined with the internal risks, could affect the Chinese economy. But because of China's macroeconomic adjustment and deepening reform and opening-up, macroeconomic operations are likely to remain stable. In the first half of the year, China's GDP growth rate stayed in the medium to high range－between 6.7 percent and 6.9 percent. Among the major economies, China's actual economic growth was second only to India's. And thanks to the continuous fall in its unemployment rate, China's job market remained stable. In fact, in the first five months of the year, China achieved more than half of its new annual urban employment goal. The macroeconomy showed positive changes in many aspects. First, the industrial structure is moving closer to the optimum level, and by continuing to grow at a high rate, the tertiary industry played an even greater role in maintaining a medium-to-high GDP growth rate and creating jobs. In the manufacturing sector, the high-tech and equipment manufacturing industries maintained a relatively high growth rate. Some service industries, such as those providing special services, grew faster than average. But the growth of some service industries, such as the financial and real estate industries, slowed down. Second, the overall demand structure has become more reasonable and stable. The final consumption expenditure played a bigger role in GDP growth, and household consumption upgrading continued. Expenditure on medical care and other services, and consumption of daily use commodities grew at rates higher than average, with online sales of services growing faster than online sales of commodities. All these reflect the vibrant development of the new economy, as well as Chinese people's upgrading consumption structure. Besides, the dependence of fixed investments on policies reduced, with the overall fixed investment growth declining sharply but private fixed investment growing at a faster pace. 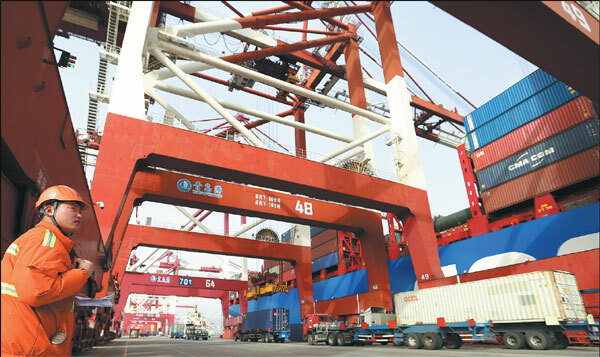 Third, China's foreign trade structure has continuously improved. Factoring out the impact of the foreign exchange rate, the trade in goods grew steadily. And China's dependence on foreign market demand declined. Fourth, at the micro level, incomes and profits of enterprises in general grew at a high pace, and their production cost gradually reduced. Although China's macroeconomy grew steadily, the growth rate of people's actual income and fixed investment declined, and industrial enterprises didn't perform as well as expected. And the service trade deficit in fields such as tourism and transportation grew at a faster pace, as many consumers had to travel abroad to meet their demands for certain products and services which domestic suppliers could not effectively provide. The July 31 meeting also said fiscal policy should play a bigger role in expanding domestic demand and structural adjustments, while vowing to control the flow of monetary supply and keep liquidity at a reasonable level. These measures will likely inject new impetus into China's economy in the second half. But to maintain stable growth, the authorities should do more to reduce the tax burden of enterprises, and ensure the real economy gets enough financing. For that, however, the authorities have to conduct structural deleveraging, strengthen financial supervision, expedite supply-side structural reform, encourage private investment and household consumption, improve the approval system for foreign investments, expand and upgrade the domestic market, and take measures to ensure foreign and domestic financial risks don't combine to pose a big threat to China's economy. The author is a researcher at the National Academy of Development and Strategy, and professor of economics, Renmin University of China.